Theatre for school assemblies and residency programs that stimulate imagination, emphasize critical thinking and build cultural awareness. Here we outline the core curriculm and national arts standards supported. Students laugh while they are learning on multiple levels. Study Guides for teachers are available. Workshops and residency programs extend the educational experience for your students. 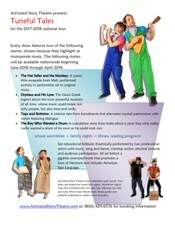 Theatrical productions based on folktales and classic stories enhance the language arts curriculum and inspire kids to read. A large oversized book serves as the set for the multicultural folktale theatre production. As the stories are performed the pages turn to depict the scenes. Reading is a big part of what we do and books are promoted at every opportunity. Because young children respond to gestures and movement before react to spoken word, American Sign Language (ASL) is incorporated as both a means of communication and a performance art. ASL is captivating for hearing students of all ages to watch, and it helps foreign students pick up English. The show along with the study guide provided for teachers to use with their classes addresses the following curriculum standards outlined by Common Core Standards. Throughout time, the arts have been essential to human existence. Through the arts people discover ways to shape and share their thoughts and feelings. The arts enrich the quality of life, improve problem solving abilities and communication skills. Act!vated shows, residency programs and workshops are designed to support K-8 standards in Theater, Dance, Music and Visual Arts as prescribed by the Kennedy Center's ArtsEdge. 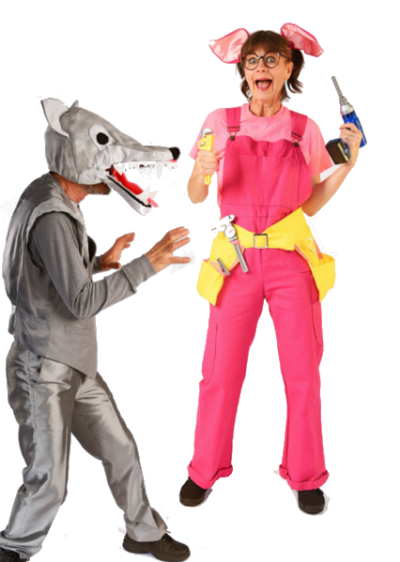 Act!vated Story Theatre action-packed productions feature a variety of performance art skills including: theatre, music (song and dance), acrobatics, clowning, vaudeville and mime. Kids get in on the act. Pre-selected students will learn acting techniques while they learn a role in the show, then they perform on stage. Students and adults alike get a big kick out of the unusual props and costumes. Many will be inspired to make their own creations once they realize they are made from items found around the house. Stories rich in American Heritage and a multicultural theme are purposefully chosen to so that teachers may use the shows as a springboard for further study of the cultures they represent. Our study guides provide educational tie-ins to help teachers relate the show to math and science. The act!vated performance style we have developed to "tell" the stories require nonstop physical activity. Being a performer demands the discipline of an athlete. Students and adults alike are awed by the sheer physical nature of the show. The shows incorporate a variety of physical performance art skills including: dance, acrobatic tricks, clown skills and pratfalls - not to mention squeezing through tennis rackets. Please visit the booking information page for details and send us an email to schedule program or request more information for your school. Bringing theater arts to underserved populations is important to us, we will do everything we can to work with your budget. Funding opportunities may be available, just ask.